One gentleman in particular can arguably be credited for the way most of us use the Internet today! Michael Jones, a patent holder, and also the source of numerous legal battles which have resulted in hundreds of lawsuits and millions of dollars in settlements. The patent Jones holds is based on an encryption algorithm invented in 1987 well before the Internet became available. Essentially, many commerce and communication sites use what’s called Secure Sockets Layer (SSL) protocol to communicate securely over the Internet. Specifically, a SSL session encrypts data flowing between two parties, usually the end-user (yourself), and the content provider (think Amazon, GoDaddy, etc.) Internet content providers that utilize SSL protocol encryption includes everything from email providers, Internet faxing, IM’ing, to voice over IP (VoIP) vendors. However, Mr. Jones patent, US Patent No. 5,412,730, which was originally granted in 1989, predates the internet all together. One may ask, how can a patent before the internet, control internet content providers today? Apparently his original patent application was written broadly enough to justify “suing hundreds of websites yet narrow enough that the case shouldn’t be dismissed as irrelevant over the encryption that existed at the time,” Joe Mullin reported for arteschnica.com. To date, Mr. Jones has received confidential settlements from over 120 web content providers for SSL protocol use. One particular company however, decided it would not pay Mr. Jones licensing fees for a patent that was issued before the technology being used was created. Newegg, an online digital retailer, decided to forgo any talks of settlement and take its patent claim defense to the court of law. Specifically, New Egg’s top attorney, Lee Chang, has determinately decided not to pay any settlements to Mr. Jones or his holding company associated with the patent. Mr. Lee basically summarized Mr. Jones and his subsequent holding company as a “Patent Troll,” as he and his legal team prepares for court. 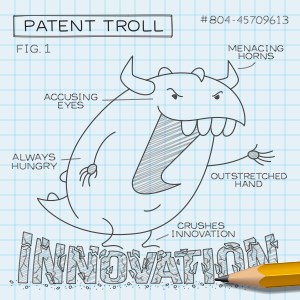 A Patent Troll is defined as “a person or company who enforces patent rights against accused infringers in an attempt to collect licensing fees, but does not manufacture products or supply services based upon the patents in question.” Simply put, it’s loosely analogous to cyber-squatters, those who pre-purchase popular website domains in hopes of cashing in from anyone wishing to purchase that domain later. 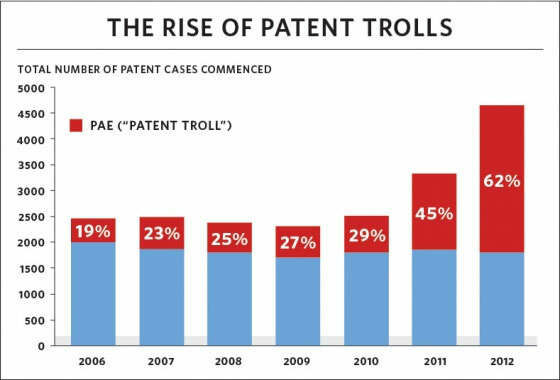 The White House conducted a study and discovered that patent-troll related lawsuits were up 400% since 2005, and victims of patent trolls paid nearly $29 billion in 2011 alone. The reason this court battle is so significant is because most corporations who are hit with a patent challenge simply weigh the cost of patent litigation against paying licensing fee’s then usually opt for the less expensive latter. The result of this cost benefit analysis usually leaves patent holders like Mr. Jones with a nice portfolio of royalty paying clients. Mr. Lee’s decision to fight back is being held as courageous among many industry insiders. Principally, a court victory for Newegg, an any subsequent precedent that is set by the court’s outcome would affect all potential SSL protocol users both past and present. Corporations currently paying licensing fees for Mr. Jone’s preexisting technology include heavyweights like; Verizon, Lowe’s, CVS, Sprint, Amway, State Farm and Aflac. Newegg and Mr. Jones’ holding company, TQP Development, will face off in federal court in Marshall, Texas. This particular venue has long been held as a favorite among patent litigators because of its seemingly speedy litigation processing. Although TQP’s patent expired in May 2013, the law provides patent holders to seek retro-active claims up to six years prior. 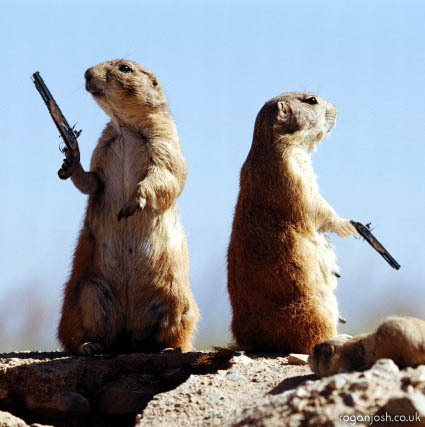 We’ll continue to monitor this one and report on the outcome!